“Grab was started because the taxi system in Malaysia was a mess,” recounted Lim Kell Jay, head of Grab Southeast Asia, at a dialogue last month. Lim spoke about the safety record of Malaysia’s taxi industry, which at the time left much to be desired, particularly for women passengers. Armed with an acute understanding of the pains of getting from point-to-point, Grab enabled its passengers in Malaysia to take due precautions by sharing the progress of their rides in real-time data with someone else. The start-up’s growth story of scaling up from one country to eight others in a span of merely six years — and defeating U.S.-based Uber, which is 12-times Grab’s size by market valuation — is quite remarkable. 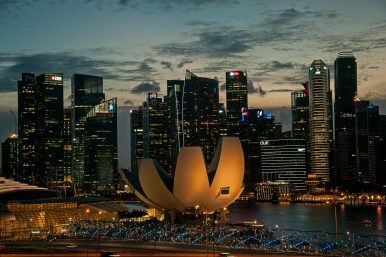 Yet today, the Singapore-based enterprise has been faced with a talent crunch of data analytics skills needed to fuel its growth plans across the Association of Southeast Asian Nations (ASEAN). Data literacy, defined as the ability to see and understand data is one of the world’s fastest growing in-demand skills. The International Data Corporation (IDC) predicts that worldwide revenues for big data and business analytics will reach more than $210 billion in 2020 as more enterprises and governments try to make sense of the data deluge, a 20,000-fold leap in data volumes between 2000 and 2020. The data scientist, in turn, has been dubbed the “sexiest job of the 21st century” by Harvard Business Review while jobs that require data skills recorded 17 times the rate of growth between 2013 and 2017, reported Linkedin’s 2018 Emerging Jobs in Singapore. Demand for data skills is high but supply is crucially low in ASEAN. For instance, Malaysia and the Philippines will need 20,000 and 340,880 data scientists, respectively, from now until 2022, according to Asia-Pacific Economic Cooperation (APEC). While this works out well for early adopters of data skills, it could be ruinous for companies in the region if this shortage is not addressed. “We’re evolving to become a superapp, and to get there, we need to be able to predict all sorts of things and simulate all sorts of situations. Data science plays a critical role in that mission… However, there’s not enough talent in the world to support every ambitious company in the market,” said Lye Kong Wei, Grab’s head of data science, in an interview in July. As the world’s third largest market, with a ride-hailing sector that is forecast to be worth more than $20 billion by 2025, ASEAN’s talent crunch in data skills poses a serious liability for companies like Grab, and by extension, the 635 million-population region’s ambitions of becoming an integrated economy in the digital age. For this reason, ASEAN leaders adopted a blueprint at the 27th ASEAN Summit in November last year to make the regional grouping more integrated by 2025, with a renewed focus on developing its human capital. To that end, ASEAN ought to start with its young. Over 60 percent of the region’s population is under the age of 35. “The young are estimated to represent 75 percent of the workforce by 2025 in many countries,” said Rocky Scopelliti in his book Youthquake 4.0. He believes that such an inflection point will significantly influence economies through the rapid adoption of technology and the application of data skills by these younger workers. This is especially relevant at a time when seven out of 10 of the world’s most valued companies today have their business models predicated on data and analytics, according to a McKinsey Global Institute 2016 study on competition in a data-driven world. Upon examining the profile of employees in these companies, one finds a workforce whose average age ranges from 28 years at Facebook to 33 years at Microsoft. This should come as no surprise as young people were found to be the world’s biggest segment of tech adopters and drivers of internet activity. As ASEAN Chair this year, Singapore can contribute to the region’s levels of data literacy by sharing its own lessons with fellow members. Singapore has been recognized as the most data literate nation in the world and achieved that by cultivating data skills among its citizens from youth. A recent study by the University of Pennsylvania ranked Singapore as having the world’s highest corporate data literacy scores, defined as the ability of a company’s workforce to read, analyze, and use data for decisions; communicate with data in the organization; and use that data in decision-making for work purposes. Singapore had a score of 84.1 compared to 81.3 in the United Kingdom and 79.0 in Germany. For many years, my company Tableau Software has spearheaded the teaching of visual analytics in the universities and tertiary institutions in Singapore for free. Polytechnics like Ngee Ann, Nanyang, Temasek, and others are teaching visual analytics in their diploma courses. Just last month, Nanyang Technological University announced that it will be using Tableau to equip 900 to 1,000 students each year with skills like data storytelling and exploration. Beyond these lessons in academia, Singapore has also been supportive of strengthening ties among ASEAN’s young by initiating Track Two diplomacy, as veteran diplomat Kishore Mahbubani and Dr. Jeffrey Sng point out in their book titled The ASEAN Miracle. These are exchanges among nongovernmental organizations and citizenries, as opposed to Track One cooperation between governments. One such platform is the newly launched ASEAN Youth Fellowship program. It is a leadership development program for young changemakers from the region, jointly led by Singapore’s National Youth Council (NYC) and regional think-tank, the Singapore International Foundation. I hope that Singapore’s humble experience in inculcating data literacy and facilitating dialogue with our young might offer useful lessons for fellow ASEAN members. For we should fully harness the natural advantages of our young and vibrant population in our bid to transform into an integrated, digital economy. Marcus Loh is director for Asia Pacific communication at Tableau Software, the world’s leading visual analytics company.